We have made a small improvement and behaviour change to the Affidavit Compliance Report R205 that will be live on July 29th. By default the report now shows activity only on the most recent version of an affidavit. 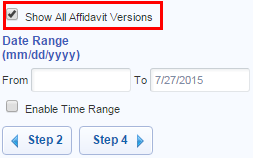 We added a column to indicate users who previously accepted another version of the affidavit. In the example below you can see that our fictional affidavit learners, Jessica Hale and Rodney Miles, have not accepted the current version, but did accept a previous version. The timestamp of the user's acceptance and the previously accepted columns will match if the user has accepted only the most recent version. Previously, the report showed all versions of an affidavit. This option is still available, as a selection in Step 3 of the report wizard.